St. Patrick's Day Shamrock Cookie recipes. We have many traditions in our house. Making shamrock cookies for St. Patrick's Day is one of them. In a large bowl, beat 1½ cups butter until smooth. Add 1 ½ cups confectioners sugar to the butter; blend together. Beat in 6 egg yolks, vanilla extract and the salt. Stir in the flour and beat until creamy. Form the dough into a ball; wrap with plastic wrap and chill for 30 minutes. Roll out the dough to about a 1/2 inch thickness. 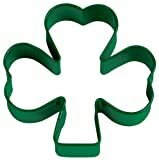 Cut out shapes with a shamrock cookie cutter. Line a cookie sheet with parchment paper and place the shamrocks cookies on them about 2 inces apart. Place in the oven and bake for 8-10 minutes or until slightly golden. Remove the shamrocks from the oven; cool and then transfer to a wire rack. Add a few drops of green food coloring to the white icing; mix well. Ice the cookies with a thin layer of icing. 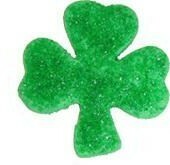 Sprinkle the shamrock cookies with white crystal sugar or green sprinkles. Metal cutters from Wilton are built to last through the years of cookie-making; they cut clearly through dough and release with ease. Use exact measurements that the recipe calls for. If you don't have a non-stick cookie sheet, you can use parchment paper for stick free baking and easy clean up. Cookies spread while baking so you should always leave a 2-3 inches space between them. Let chilled dough adjust to room temperature before rolling out. Cooling first will make it easier to roll out. Use large eggs unless a recipe calls for smaller ones. A Delicious Shamrock Shake - Goes Well With Shamrock Cookies! Combine vanilla ice cream, milk, mint extract, and a couple drops of food color in a blender; blend until smooth. To make the shake a darker shade of green, add a few more drops of green food coloring until the desired color is reached. Share Your Favorite Cookie Recipe On Wizzley! excellent, you made it so easy, even I can do this! Cookies and Shake sound great.